Concert starts at 3:00pm, we are in the second half of the concert. The other performers on the bill include: Renée Dahn, Sannu Lawt, and Jillian Clow. Renee is a Singing Strings alumna and Sannu is a current member of the Senior Singing Strings, so we would love to give them wonderful support by filling the audience! Tickets are $15.18 for adults and $12.90 for students/seniors. Parents will need to buy tickets to watch the concert. For Junior and Intermediate students, the call time is 2:30pm, and we will plan to meet outside in the tent to the left of the church. If weather is inclement, we will meet inside the church. If you have any questions, please don’t hesitate to contact either myself or your conductor for more details. Junior Singing Strings performs at Spring Park School! 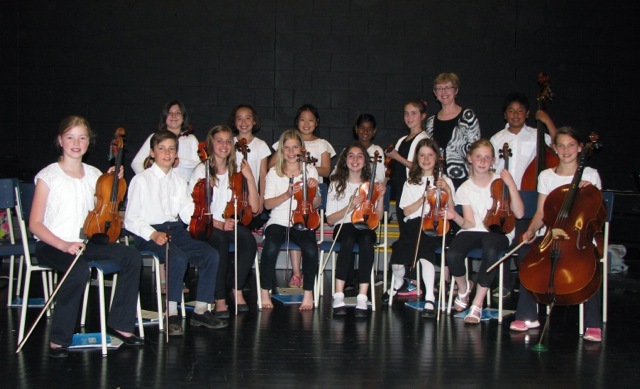 Congratulations to the Jr. Singing Strings for a great concert at Spring Park School last week. I was especially proud of how well they played Orpheus! Our closing event for the three orchestras is at Park Royal beginning at 6:30 pm on Wednesday (June 18). I would like all of the students to meet in the parlour between 6 and 6:15 so that we can be tuned and run through Skye Boat Song before the program. All of the violins need to have their part memorized for Wednesday. We will play Fiddlin’ to Boston at the beginning of the program, followed by selections from the Intermediates. Before the Senior selections we will play Skye Boat Song and Orpheus with the three orchestras together. After the Seniors play we will have a reception at the back of the church. Each family is asked to bring something to share at the reception. Dress for all concerts is white and black, and I would like all of them to wear shoes when we are performing. Thank you to all of the parents for your support this year. A special thanks to Aung Lawt for the photo of our school concert.